Storage units are the best solution for your storage needs. When you don't have enough room around the house or personal business to store your items, you'll want to have a secure place to store your belongings. There are, however, certain things that must not be placed in a storage unit and as a guideline, we have listed many of them below for you. 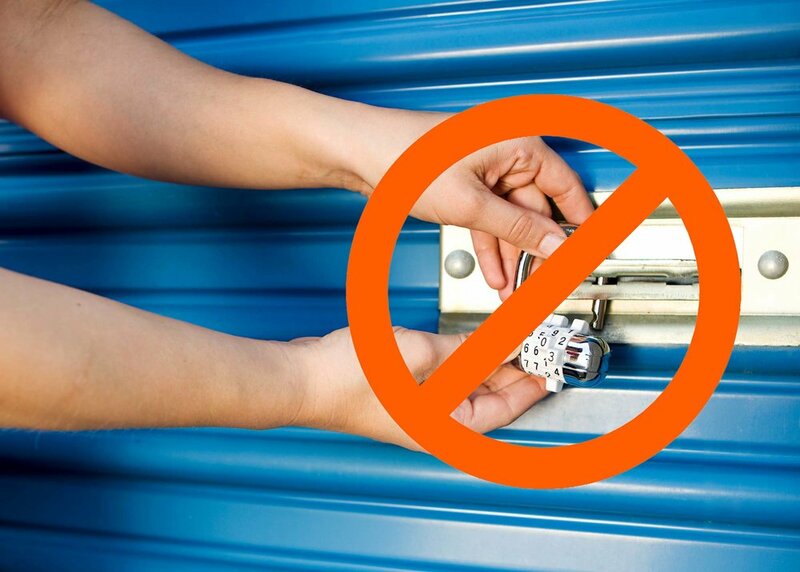 Anything illegal or stolen must not be placed in a storage facility. As well, you must own what you are placing into storage and cannot place anything that is titled to somebody else without permission to do so. Perishable food can attract a number of different pests including insects and rodents. Additionally, as the food starts to rot the smell will become overpowering and affect the other items in storage. We hope this one is obvious but animals should never be placed in a storage unit even for a small amount of time as it is both cruel and illegal. The unit is dark when not in use, confined and not suitable for any living creature. Plants as well should not be brought in since they can attract pests and are sure to die within a short amount of time. Flammable liquids like oils and fuels or explosive items such as propane tanks, fireworks, firearms and ammunition should never be placed inside the unit. This can lead to a very dangerous situation that puts you, your belongings and other people at risk. At Storage Centre we are here to help keep your valuable belongings protected with our self storage solutions in the Etobicoke and Toronto area. If you have any items not listed above that you have questions about storing, please contact us or take a look at our website at storage-centre.ca. Be safe out there! When it comes to packing up your possessions for storage, there are few general guidelines to note. Whether you have a unit for business or residential purposes these tips can reduce your stress, increase your efficiency as well as set you up for ongoing secure and easy access down the road. The last thing you want is to get into your packing flow only to realize that you forgot to pick up a few supplies. Items to consider are as many boxes as you think you’ll need (same sizes are best), tape, markers, mattress cover and packing material (e.g. bubble wrap, newsprint). Check out Storage Centre’s list of available supplies here. Making sure you aren’t rushed will not only reduce stress but it will give you additional time to make sure you have everything packed away in a secure and orderly fashion. The extra preparation time will also allow you to double check your items list and ensure that nothing gets forgotten. Using uniform and similar sized boxes will make stacking inside your unit easier as you may want to build upwards to make the best use of your storage space. Stacking can then be made even easier by not overfilling or underfilling each box. Once each box is filled make sure to A) seal it up with packing tape, so no dust gets in and then B) label it so you don’t have to rip off the tape you just used to figure out what’s inside. For boxes with too many items to list on the side, try labeling the box with a number “1” and then correlate it to a more detailed list of the same number either stored on paper or your phone. Finally, for boxes with glass or breakables you may want to label as “FRAGILE” in case you have a friend or mover helping you who may not know to take extra care of specific boxes.